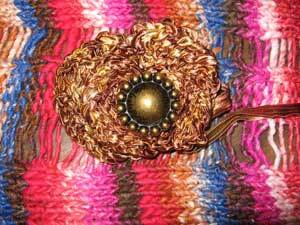 Embellishing is an active process and for many of us never stops. I see a piece and often think of how I might alter the look by adding a simple button, some fringe, a couple embroidered stitches and so on. I had this wonderful vision of the items I wanted to add to the shawl. Often times when embellishing you have to wait for the right items to present themselves. I played with a number of yarns, looks, buttons textures but nothing quite grabbed my attention. I actually stopped looking and decided to revisit the embellishing another day. As I was walking through the store I noticed a button on a bottom shelf and decided it was just perfect(carpe diem!). I fringed the shawl, knit a flower to go with the button and then tried to attach it. 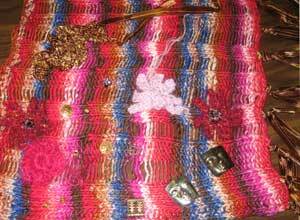 As soon as I lifted the shawl up I realized my mistake with this embellishing venture. Because of the dropped stitch the fabric of this shawl becomes very open and drapey, not of the substance necessary to carry off what looked wonderful on the table. I decided that sometimes simplicity is best and decided to scrap all of the embellishments but the fringe. I now have a freeflowing swishy shawl which is perfect just the way it is.